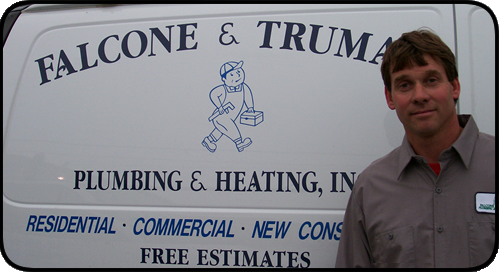 In 1976 John Falcone and James Truman opened up a small plumbing company with a commitment to be the most honest, dependable and reliable in the industry. Joined by Ron Falcone in 1977, Jordan Falcone in 1994 and John Falcone Jr in 1999 our company has grown to as many as 25 employees serving the tri-state area. At Falcone and Truman we will stop at nothing to insure your satisfaction with every phase of your service experience. Always neat and clean, our goal is to leave you with the assurance that you have chosen the right company for your needs. We even go so far as to offer a 1 year warrenty for our service customers, something that is unheard of in our business. All of our employees are uniformed and are subject to background checks as well as drug and alcohol screenings to assure your comfort in letting us enter your home or business. Try us and discover service the way it was meant to be.